Be honest: Has your life played out exactly the way you thought it would? Mine sure hasn’t. Or at least, not the way my 20-something-self envisioned it. In some ways, my life is better than I imagined. I’ve traveled to some beautiful places, I’ve been presented with opportunities I never dreamed possible, and I’ve learned that I’m a lot stronger than I ever thought I could be. But I’ve also suffered my share of heartaches and struggles along they way. There were moments when I didn’t think things would ever get better, and sometimes I had to look really, really hard to find the beauty in the difficult moments. But one thing I know for sure is that self-care has made the biggest difference in how I respond to the obstacles that appear when I least expect them. Having a solid self-care plan has shown me that I have the ability to design my life and that I really can choose how I experience it. 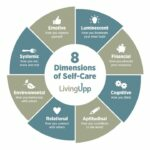 This planning guide offers an overview of Living Upp’s Lifestyle Design Process, as well as an introduction to the Lifestyle Design Studio. Lifestyle Design has been described in many ways, but here at Living Upp we define it as the process of getting clear about how you want to experience your life and then creating the conditions to manifest it. Using a variety of design tools, such as the Rate Your 8 Assessment and Self-Care Planner*, you’ll be able to clearly identify your core values, map out realistic personal and professional goals, and determine where to best invest your time and energy. Much like self-care, the Lifestyle Design process is personal. How you choose to map out your plan will depend on your unique personality, beliefs, values, strengths, and interests. Your best lifestyle supports your greatest needs, not someone else’s. And your plan should leave you feeling confident and capable. If it doesn’t, then it’s probably time for a revision. In the first phase, you’ll learn how to assess 8 key dimensions of your life using the Rate Your 8 Assessment Tool. This simple exercise helps you determine which areas you’re supporting well and which need more support. Taking inventory is an important first step because it helps you identify your greatest opportunities for improvement. Learn more about the Rate Your 8 assessment tool here. In the Envisioning phase, you’ll create visual images of the future you want to create. This may include putting together a vision board, creating a piece of art, meditation, or some other method of bringing those images to life. Staying focused on your vision makes the planning process much easier. This phase often gets overlooked, yet it’s probably one of the reasons you’ve given up on goals in the past. The commitment phase looks at your readiness to pursue specific goals. There’s an art and science to goal achievement, and assessing readiness is a vital when it comes to sustainable behavior change. The final phase of the Lifestyle Design Process is where you begin to manifest the life you’ve envisioned. In this phase, your vision begins to come to life in the form of new opportunities and helpful people who bring you closer your goals. This is also the point when you start to feel more alive as you find a sense of balance and ease with your new habits and routines. And who doesn’t want to feel alive? In the Lifestyle Design Studio, we cover a lot of ground — from how to establish your personal brand, to improving your financial well-being, to creating a healthy eating style that fits your unique health needs. As a studio member, you’ll have access to a wide variety of planning and design tools, as well as a supportive community that offers an extra layer of motivation and accountability. Ready to do life differently? Learn more about the Studio here. This entry was posted in Lifestyle Design Strategies and tagged planning.